Country Restrictions: Russia, Ireland, Lithuania, Netherlands Antilles, Germany, Romania, Israel, France, Estonia, Cyprus, Bulgaria, Belgium, Turkey, Portugal, Philippines, Slovenia, Spain, Austria, Hungary, USA. 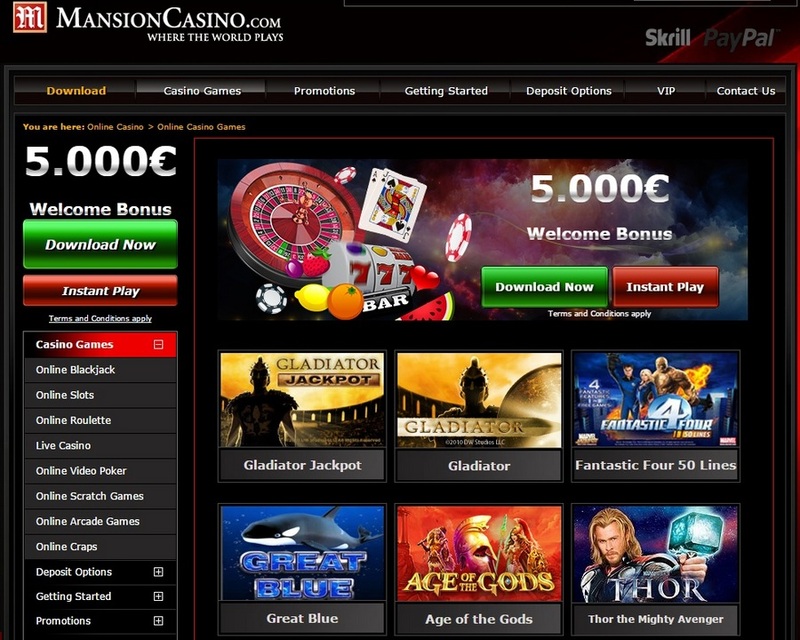 MansionCasino.com is operated by Mansion Online Casino Ltd of Suite 901 Europort, Gibraltar under a license issued by the Gibraltar Licensing Authority, RGL No.029 and regulated by the Gibraltar Gambling Commissioner. 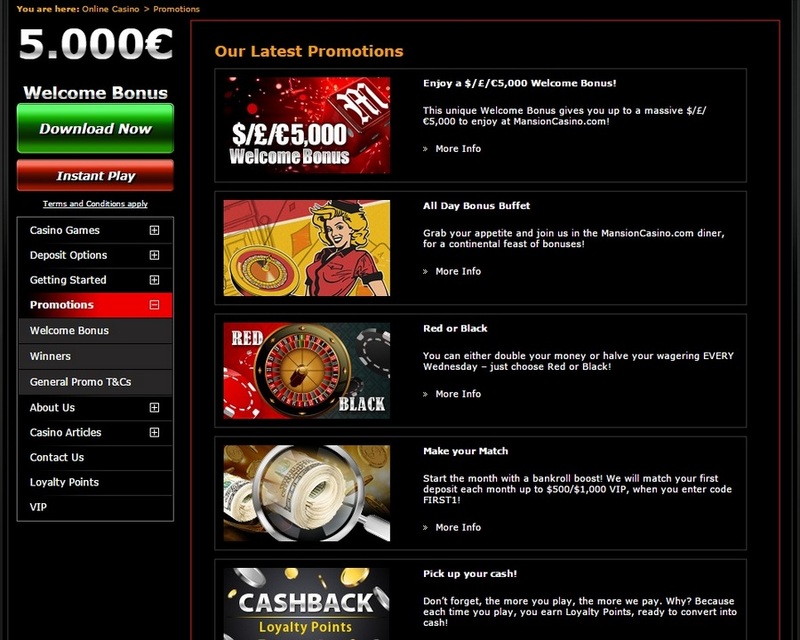 The casino has a set of advantages, among which there are: a high-quality design of the website, the convenient menu, a wide choice of games, the round-the-clock support service, and generous bonuses. However, many players choose the portal because of its unique atmosphere combining luxury and spirit of passion. The combination of red and black doesn't strain, it is possible to play for hours and not to feel any anxiety. Besides, the convenient control panel is located above. It will be quite enough to wander on pages of a resource without any problems. Having got to a lobby and looked around a little, player has resistant associations with the best gambling institutions of Las Vegas because here is so beautifully and stylishly as in the real Vegas casinos. The casino works according to the license of Gibraltar and is regularly checked on fair play by independent auditors. It accepts different currencies: euro, dollars, and pounds. 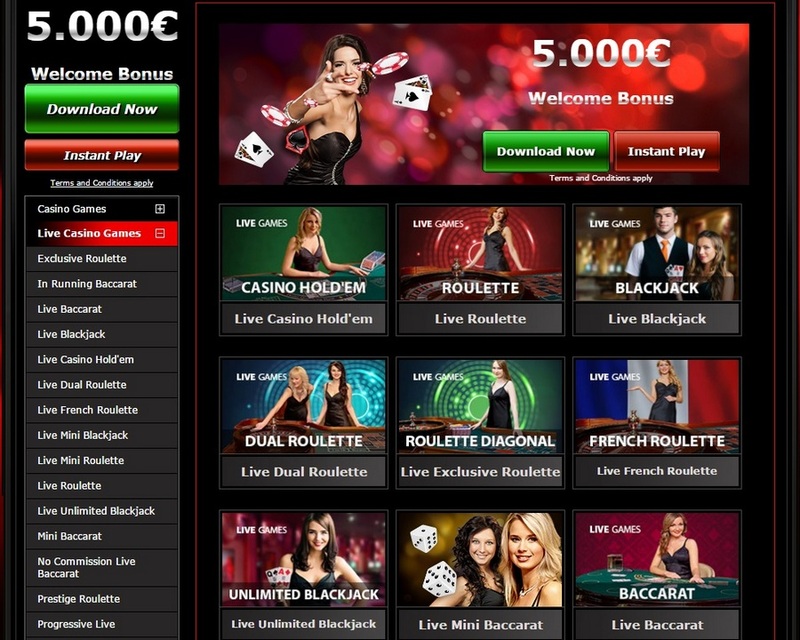 The basis of the portal is the software made by the Playtech Company. You can play here not only on the website but also in the downloaded app. For this purpose, it is necessary to load the client part on the computer and to undergo the fast procedure of installation. The casino has quite a standard set of games. All of them are created at the high level. Fans of slots will be pleased by a wide choice of gaming machines of various genres and subjects. The special attention is drawn by progressive slots, the jackpot casino of which quite often reaches the phenomenal sums of several million dollars. There is also a good choice of board games and gambling of casino. There are several kinds of poker, blackjack, a Baccarat, craps, and roulette. Those players who don't want to be limited to games with automates can pass into the section of the live casino, where you will be met by live dealers. The majority of games are available in the training mode. For account replenishment, it is possible to use the majority of popular payment tools: NETeller, Skrill, cash cards (Visa and MasterCard) and so on. Look at the full list of available ways in an appropriate section of the casino. • 50% bonus on the first deposit for high roller (the minimum sum of account replenishment has to be 1000 dollars, the maximum size of a bonus is no more than 5000 dollars). • Access to unique actions. The casino also holds various actions allowing earning the additional amounts in the shortest time. For example, on Wednesdays you will be able to choose the black or red section in roulette and to receive an additional bonus, having entered the RED or BLACK code and having input the corresponding deposit. This game club works for a long time and values its reputation. The support service is intended to solve all problems of clients most quickly. It is possible to use a special form or to call the support. At once, it is necessary to tell that experts resolve issues quite perky. But they are not all-powerful. Therefore, sometimes it is requested to reconcile to rules of the casino, which are rigid. Anyway, such support service is an undoubted plus.